Guerrieri, who finished third overall in the drivers' standings last season, dragged his Munnich Motorsport-run Civic Type R to a fastest time of 1m24.773s to beat Muller's early benchmark by 0.239 seconds. 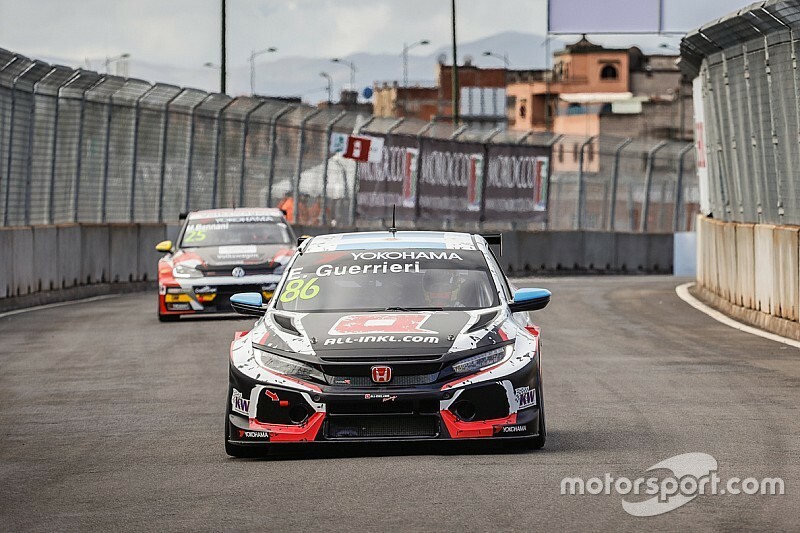 That effort was around a tenth slower than the time with which Thed Bjork claimed pole for last year's season opener at the Moulay El Hassan street circuit, and marks the Argentinian's first qualifying pole position since the series adopted TCR regulations. Muller might well have challenged him for top spot, but was forced to sit out the second half of the session after an error. The four-time World Touring Car champion had led by a couple of tenths in the early part of the 40-minute session, but then struck the kerb in the second part of the Turn 4/5 chicane. His Cyan Racing team discovered an oil leak on his return to the pits, and Muller was not able to return to the track in the team's new Lynk & Co 03. Speaking after the session, Muller said his engine "was not in the best condition", and Cyan decided prior to the race to change the engine in his car. Muller will therefore start the race from the back of the 26-car grid, moving everyone else up one position, but he will keep the four points he earned by qualifying second. The Frenchman's stablemate Thed Bjork qualified third in his Lynk & Co 03, 0.037s slower than Muller, while Nestor Girolami made it two Munnich Hondas in the top four. A late improvement from Girolami bumped the third Lynk & Co of World Touring Car returnee Andy Priaulx back a place, but the three-time world champion nevertheless qualified a strong fifth - 0.365s off the pace. Reigning champion Gabriele Tarquini complained of engine problems in the early stages of the session but qualified best of the BRC Hyundais, dragging his i30 N to sixth place. Jean-Karl Vernay (WRT Audi) was one of a number of drivers to suffer a puncture in qualifying but set a time good enough for seventh, with Tiago Monteiro eighth in his KCMG Honda in his first qualifying session back in the series full-time. Muller's nephew Yann Ehrlacher made it four Lynk & Cos in the top 10 in ninth, while series debutant Daniel Haglof turned in an excellent time to secure 10th in his PWR Cupra. The lead Alfa Romeo Giulietta Veloce of Kevin Ceccon qualified 11th, ahead of Hyundai drivers Norbert Michelisz and Nicky Catsburg, while Volkswagens cars struggled during the session. 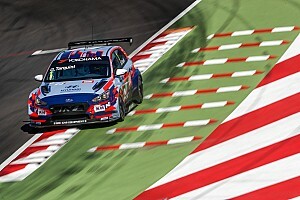 Rob Huff was the brand's lead representative in 16th, 0.761s off the pace, with team-mates Johan Kristoffersson - the double World Rallycross champion making his first WTCR qualifying appearance - and Mehdi Bennani 20th and 21st. Benjamin Leuchter was 25th of the 26 runners in the fourth Sebastien Loeb Racing-run Volkswagen Golf GTI, ahead only of fellow debutant Attila Tassi.